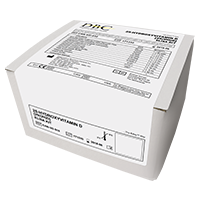 A Fast & Accurate 25-Hydroxyvitamin D ELISA kit - Diagnostics Biochem Canada Inc.
DBC has created a FAST and ACCURATE Vitamin D ELISA kit which requires no sample preparation. Vitamin D concentration in blood should be measured regularly to ensure that satisfactory physiological levels are maintained year-round. 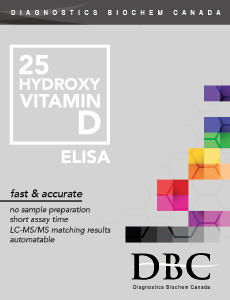 The DBC 25-Hydroxyvitamin D ELISA kis measures the total concentration of both 25-Hydroxyvitamin D2 and 25-Hydroxyvitamin D3 (25(OH)D). No lid, and no shaking required!